It’s probably best if I preface this preview with an admission of sorts: I generally don’t care much for role-playing games. That’s not to say I hate them, or never play them. I adored Chrono Trigger and Earthbound as a child, moving onto the earlier Fallout titles, and even dabbling in the occasional Elder Scrolls. Even after all that, RPGs are never my first choice. Maybe it’s my dislike of fantasy settings, maybe its my inability to commit to anything for that long (this is why I’ve never FINISHED an Elder Scrolls game, and it took me embarrassingly long to finish New Vegas, but they just don’t frequently click with me. It is with this in mind that I hastily agreed to preview the new Divinity title, Divinity: Original Sin. I had seen stories about its wildly successful Kickstarter, an article I’d read about its level editor and character interactions seemed pretty cool, and I could have sworn I’d played a Divinity game before. It turns out I’d never played Divinity and I was actually thinking of the Sacred series, but was that gonna stop me? I’d already devoted the space in my Steam library to the early access beta, it was too late to turn back! 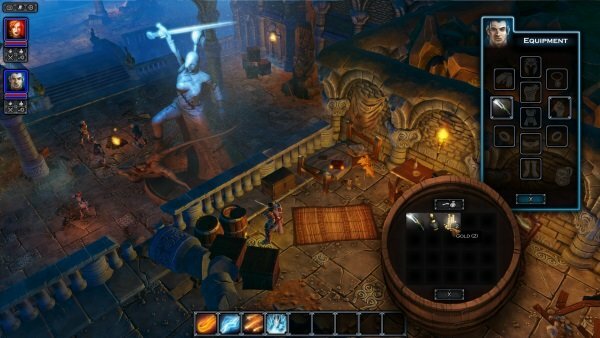 Original Sin is the newest in the surprisingly long series of Divinity series of fantasy games, stretching back to the 2002 Diablo-esq RPG Divine Divinity, from Belgian developer Larian Studios. Standing as the third main game in the series not counting the expansions and spin-offs, Original Sin exists almost solely as a result of its Kickstarter campaign. 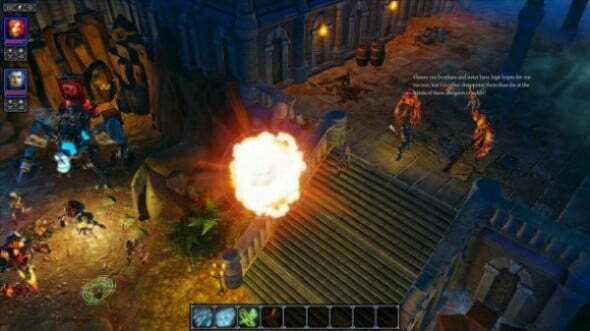 Larian had long been hoping to make an old-school turn-based RPG for some time but their publisher would always force them in a more action-oriented direction to maximize sales. Now, with all the freedom that self-publishing brings, they were able to make the game they had long hoped to. The meat of the game is spent wandering about an area, talking to NPCs and getting into fights with local baddies, as many games of its ilk are. The turn-based fights proceed in a way not unlike the original 2D Fallout titles, with movement, spellcasting, and combat being limited by the available number of action points you have. You’re given full control over any given member of your party, and out of combat a simple mouse click allows you to delegate a new leader whenever you want. I found myself often preferring to control my female ranger Scarlett over beefy male warrior Roderick, mostly because I both prefer ranged attacks and found her dialogue more appealing. Leveling up should be familiar to anyone versed in Dungeons and Dragons-style skill trees and stat layouts, and the crafting and spell systems should be pretty well-known and comforting to even RPG neophytes such as myself. Where Original Sin hopes to stand out is through the open freedom of its world, and its mission editor. During the game, you will often engage in conversations that the entire party gets involved in. As opposed to other recent RPGs where you can select your own response but the party is all reading from a script, you can select the dialogue for both primary party members (the aforementioned Scarlett and Roderick) and even have them disagree or argue. These discussions will manifest themselves in their stats and later interactions, and may even lead to characters getting more egotistical or timid depending on the frequency of these conversations. The second main party member can be controlled by a friend in co-op mode, who has full freedom to choose responses as they see fit, and can even leave the party at any time to go off and have their own full adventures independently of the group. This heightened sense of interactions and player freedom surpasses the sort of ‘free-roaming’ illusion you’re typically given in mainstream RPGs and should appeal to anyone who enjoys breaking from a developer’s ‘to-do’ list. You may notice I mentioned a level editor earlier. Divinity: Original Sin will ship with the same in-game tools the developers themselves use to craft missions and story points. While Larian has warned that the editor will take a bit of learning, it will offer unrivaled flexibility to anyone who chooses to master it. The tools are allegedly powerful enough to craft whole new games inside Original Sin’s framework, citing the possibility of a science-fiction RPG or a World War 2 squad shooter as possibilities. Despite some minor early-access glitches (the occasional crash, typos and placeholder text, a lack of customization options), Divinity: Original Sin shows an awful lot of promise. The combat should scratch anyone’s Baldur’s Gate itch, and the amount of freedom and customization it offers should offer anyone looking for a respite from the march of ‘me-too’ Skyrim/Dragon Age clones a damn good time. Even for someone like me who gets all nervous and sweaty when asked to pick out their starting stats.